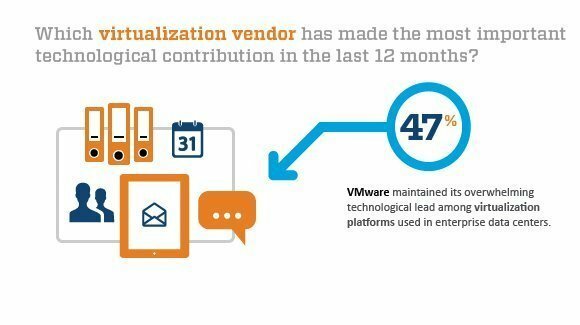 In the Data Center & Readers' Choice 2013 survey, VMware Inc. maintained its overwhelming technological lead among virtualization platforms used in enterprise data centers. VMware market share among respondents who answered the virtualization question was nearly half (47%), with Microsoft's Hyper-V virtualization platform a distant second at about 24%. Citrix Systems trailed in third place among virtualization vendors, with about 8% of respondents saying Citrix made the most important technological contribution to enterprise IT, with HP and IBM close behind. Respondents preferred VMware's improved virtualization features and capabilities, particularly in ESXi 5.X, as well as how it enabled data center consolidation. Better disaster recovery and test-and-development environments also garnered respondent interest in virtualization vendors' platforms.